How to Restore Windows 7 Backup to Another Computer? 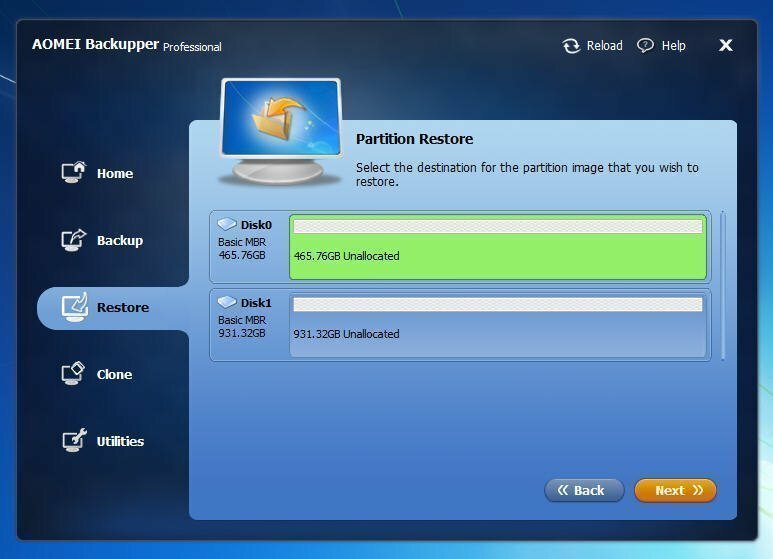 How to restore Windows 7 backup image to another computer with dissimilar hardware? This article will tell you the simplest way to restore Windows 7 backup to dissimilar hardware with AOMEI Backupper. With time goes by, Microsoft released Windows 8/8.1 and Windows 10. However, there are plenty of users still uses Windows 7 operating system. As a loyalty fan of Windows 7, you may want to use it all the time, but your computer has a limited lifetime that once your computer broken, you have to replace old computer with a new one. However, you still want to keep your well-adjusted Windows 7. Fortunately, there are many ways that you can keep your old Windows 7 system on the new computer, if you have backed Windows 7 system up before. Many Windows 7 users have backed up system after installing system, which can prevent the system crashes effectively - you can use it to restore the system to rescue that situation. Or if there are numbers of computers waiting for installing system, you can install one computer and make a system backup, then restore the system backup to the rest computers, that would save a lot of time. To restore Windows 7 to another computer means to restore Windows 7 backup to dissimilar hardware. So, here is the question, we know that the Windows backup and restore tool can help users backup system image and restore it to recover the system, but how to restore it to another computer? You can create a bootable disc by Windows tool, but you have to know that the Windows built-in tool will take use of large volume of the disc space. Thus, here we highly recommend you to use AOMEO Backupper to backup Windows 7 and restore to another computer. AOMEI Backupper is a complete software for data backup and restore. Windows PC users can use the free edition to do backup and restore. With the help of AOMEI Backupper, things would go easier than before. To restore Windows 7 backup to another computer, here are something you need to prepare previously. Download AOMEI Backupper. AOMEI Backupper has different editions in order to meet different needs and OS. Ensure that you have a Windows 7 system or disk backup image. 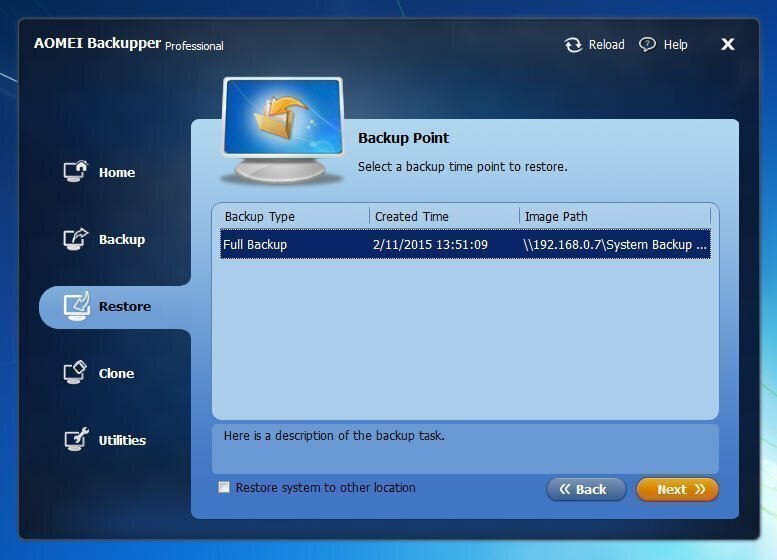 If you forgot to backing up before, you can use AOMEI Backupper to backup system or you can use it to backup system from other Windows 7 computer. Prepare an external hard drive which is enough to store Windows 7 backup image. You can store it on network. Create a bootable disc so that you can boot new computer from the disc. After preparing, you can restore your Windows 7 from one PC to another one. Step1. Boot another computer from the bootable disc you created before. Step2. Then, you will see the deep-blue interface of AOMEI Backupper. Click Restore and select System Restore to start. Here you need to click Path to find the Windows 7 backup you saved on external hard drive or network, select it and click Next to move on. Step3. 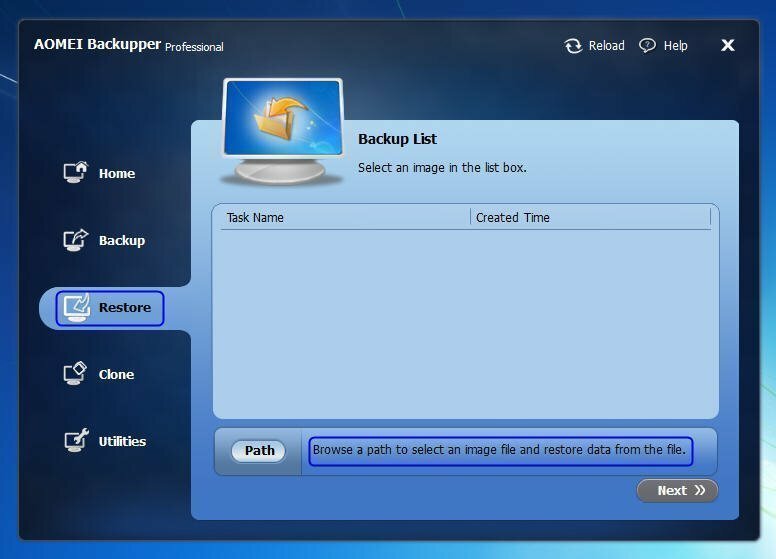 When you selected Windows 7 backup, you should select the disk which you would like to restore backup image on. Step4. Then, you will move to the Operation Summary page and confirm the information, and then click Start Restore to submit all the operations. You will find that there are some options under this window. The "Enable Universal Restore" is checked by default. If your destination disk is an SSD, you can check the option in front of "Align partition to optimize for SSD" in order to get a better performance after restoring. With the help of AOMEI Backupper, you can restore Windows 7 backup to another computer with dissimilar hardware. Actually, this operation is also working on Windows 10 and Windows 8. Besides, you can use it to synchronize files between two computers, migrate OS and more.